While out flying his trusty airplane, Bulldog, Wario crashlands in the middle of a forest. He finds a mysterious music box in a nearby cave. As he approaches, he is sucked into a magical world. A mysterious figure awakens Wario and begs him to help. The monsters have imprisoned him, so Wario must collect the treasures if he ever wants to escape. 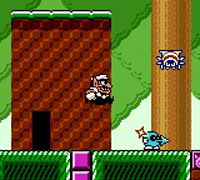 Wario has to use his attacks and transformations to find keys and treasure chests. There are four treasure chests in each stage, each holding an item that will improve Wario's abilities, change levels, or unlock new levels. One of the treasures Wario collects appears to be based on the Pokémon Pikachu virtual pet.